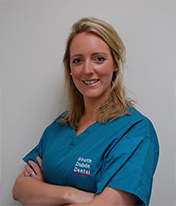 Root Canal Treatments at South Dublin Dental are carried out by Dr Hannah Granville. Hannah has completed a Masters in Clinical Endodonology (the study of root canals). For any patient that may need a root canal, a FREE consultation with Hannah is recommended. During the consultation the tooth will be assessed for suitability to carry out root canal treatment. There will be no treatment carried out at the consultation and this appointment can take up to half an hour. Longer appointments are needed to carry out the root canal treatment which can be made at the next suitable appointment time. It helps to understand the anatomy of a tooth in order to understand how and why the procedure is undertaken. Underneath the white enamel layer and the hard layer called dentine is a soft tissue known as the pulp. The pulp of the tooth contains blood vessels and nerves. If this pulp is damaged by tooth decay, cracks in the tooth or trauma to the tooth, to name just a few, the pulp becomes inflamed or infected. This leads to pain and needs to be treated by either removing the pulp and leaving the tooth in the mouth (root canal treatment) or by removing the tooth as a whole (extraction) which will leave a gap in your mouth. 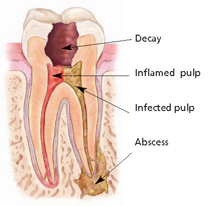 If an inflamed or infected pulp is not treated it can cause further pain and/or lead to an abscess. 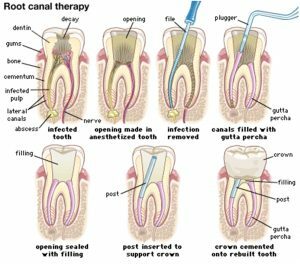 Root canal treatment is generally carried out over two appointments. During the first appointment the inflamed or infected pulp is removed and a dressing with temporary filling is placed. After one to two weeks the second stage is carried out which involves disinfecting the inside of the tooth and then filling the space with a rubber-like material called gutta-purcha. Following this the tooth is then restored with a filling or a crown. As a guide we recommend crowning back teeth following root canal treatment to prevent the tooth from cracking. If there is not a huge amount of tooth structure left following the root canal, a post and core may need to be placed to support a crown. After the final restoration is placed this tooth will function like any other tooth. The image below is an illustration of the treatment. Despite the jokes about root canal treatment being painful, modern treatment is similar to having a normal filling done, however it takes a bit longer. Back teeth are more complicated to treat than front teeth, this is reflected in the prices below which include final fillings.